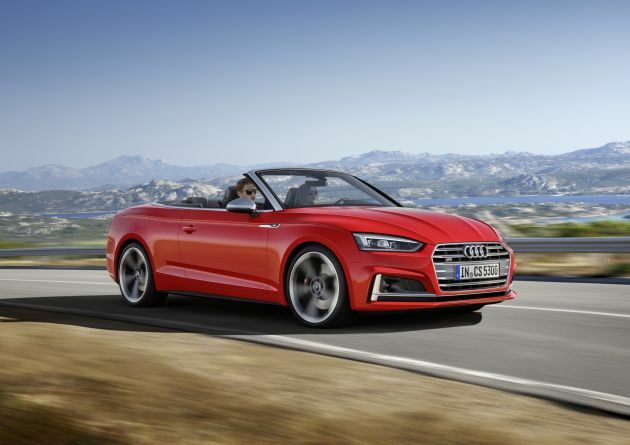 The 2017 Audi S5 Cabriolet is the higher performance model of Audi’s mid-size convertible. It compares directly to the previously mentioned BMW 440i xDrive Convertible. Just as with the Audi A3 Cabriolet and BMW 230i xDrive Convertible, the Audi S5 and BMW 440i xDrive should be shopped together. They are well matched in performance, in price and in size. The S5 Cabriolet boasts a 333-horsepower supercharged V6 engine (13 hp more than the 440i) and a 7-speed dual-clutch quick-shifting transmission. Power is distributed to all four wheels through the xDrive AWD system. The ride is firm but well controlled thanks to the standard sport suspension. Four people can ride under the acoustic folding roof, which has a black cloth headliner and an active rollover system for your protection. The 2017 Audi S5 Cabriolet is an excellent combination of performance and luxury. It comes with enough supercharged power to establish some serious street cred. But when you sink into those 12-way power front seats covered in Nappa leather, and crank up the 12-speaker 505-watt Bang & Olufsen sound system, cruising down the road may feel like a better alternative. With the S5 Cabriolet, you can go either way.